The Agricultural Adjustment Act (AAA) was a United States federal law of the New Deal era which reduced agricultural production by paying farmers subsidies not to plant on part of their land and to kill off excess livestock. Its purpose was to reduce crop surplus and therefore effectively raise the value of crops. The money for these subsidies was generated through an exclusive tax on companies which processed farm products. The Act created a new agency, the Agricultural Adjustment Administration, an agency of the U.S. Department of Agriculture, to oversee the distribution of the subsidies. The Agriculture Marketing Act, which established the Federal Farm Board in 1929, was seen as a strong precursor to this act. The law, in its entirety, can be read here. A Roosevelt County New Mexico farmer and a County Agricultural Conservation Committee representative review the provisions of the Agricultural Adjustment Act (AAA) farm program to determine how it can best be applied on that particular acreage in 1934. "The goal of the Agricultural Adjustment Act, restoring farm purchasing power of agricultural commodities or the fair exchange value of a commodity based upon price relative to the prewar 1909-14 level, was to be accomplished through a number of methods. These included the authorization by the Secretary of Agriculture (1) to secure voluntary reduction of the acreage in basic crops through agreements with producers and use of direct payments for participation in acreage control programs; (2) to regulate marketing through voluntary agreements with processors, associations or producers, and other handlers of agricultural commodities or products; (3) to license processors, association, and others handling agricultural commodities to eliminate unfair practices or charges; (4) to determine the necessity for and the rate or processing taxes; and (5) to use the proceeds of taxes and appropriate funds for the cost of adjustment operations, for the expansion of markets, and for the removal or agricultural surpluses." 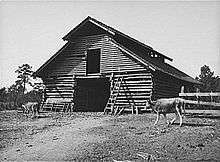 Barn on tenant's farm. Walker County, Alabama. Taken February 1937. 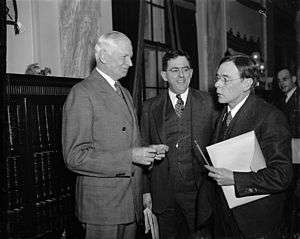 Senator Elmer Thomas is seen here on the left. He is standing with Claude M. Hurst and John Collier, members of the Senate Indian Affairs Committee, and unassociated (directly) with the "Thomas Amendment." ↑ Rasmussen, Wayne D., Gladys L. Baker, and James S. Ward, "A Short History of Agricultural Adjustment, 1933-75." Economic Research Service, United States Department of Agriculture, Agriculture Information Bulletin No. 391 (March 1976), pg. 2. ↑ Agricultural Adjustment Act, Pub.L. 73–10, 48 Stat. 31, enacted May 12, 1933. ↑ Peters,Gerhard; Woolley, John T. "Franklin D. Roosevelt: "Statement on Signing the Farm Relief Bill" May 12, 1933". The American Presidency Project. University of California – Santa Barbara. Retrieved July 4, 2013. 1 2 Hurt, R. Douglas, Problems of Plenty: The American Farmer in the Twentieth Century, (Chicago: Ivan R. Dee, 2002), 69. ↑ Harris Gaylord Warren, Herbert Hoover and the Great Depression (New York: Oxford University Press, 1959), p. 175. ↑ "The New Deal Farm Program". The Depression Begins: President Hoover Takes Command. Ludwig von Mises Institute. 1 2 Hurt, R. Douglas, Problems of Plenty: The American Farmer in the Twentieth Century, (Chicago: Ivan R. Dee, 2002), 67. 1 2 3 Hurt, R. Douglas, Problems of Plenty: The American Farmer in the Twentieth Century, (Chicago: Ivan R. Dee, 2002), 68. ↑ Rasmussen, Wayne D., Gladys L. Baker, and James p. Ward, "A Short History of Agricultural Adjustment, 1933-75." Economic Research Service, United States Department of Agriculture, Agriculture Information Bulletin No. 391 (March 1976), pg. 2. 1 2 Rasmussen, Wayne D., Gladys L. Baker, and James S. Ward, "A Short History of Agricultural Adjustment, 1933-75." Economic Research Service, United States Department of Agriculture, Agriculture Information Bulletin No. 391 (March 1976), pg. 2. 1 2 3 4 5 Poppendieck, Janet. Breadlines Knee-deep in Wheat: Food Assistance in the Great Depression. New Brunswick, NJ: Rutgers UP, 1986. Print. ↑ Powell, Jim (2003). FDR's Folly: How Roosevelt and His New Deal Prolonged the Great Depression. New York: Crown Forum. p. 134. ISBN 978-0761501657. ↑ Fleetwood, Jonathan (May 1993). "The Hog Reduction Program of the AAA". Illinois History. Retrieved 5 December 2014. 1 2 Rasmussen, Wayne D., Gladys L. Baker, and James S. Ward, "A Short History of Agricultural Adjustment, 1933-75." Economic Research Service, United States Department of Agriculture, Agriculture Information Bulletin No. 391 (March 1976), pg. 4. ↑ Badger, Anthony J (January 1, 1989). The New Deal. The Depression Years, 1933–1940. Chicago: Ivan R. Dee. pp. 147–89. ASIN B00B8TO1SY. ↑ Folsom, Jr., Burton (2008). New Deal or Raw Deal?. Simon and Schuster. p. 62. ↑ "Galbraith and the Southern Sharecroppers". David Henderson. Retrieved August 21, 2013. ↑ Smith, Fred C. (2004). "Cooperative Farming in Mississippi." Mississippi Historical Society. ↑ Hamilton, David. Agricultural Adjustment Act: An entry from Macmillan Reference USA's Encyclopedia of the Great Depression. s.v. "Sharecroppers". 1. Macmillan Reference USA. 1 2 3 4 5 David Webb, "The Thomas Amendment: A Rural Oklahoma Response to the Great Depression," in Rural Oklahoma, ed. Donald E. Green (Oklahoma City: Oklahoma Historical Society Archived November 19, 2012, at the Wayback Machine., 1977). ↑ The American Presidency Project. "Proclamation and Statement Ratifying the London Agreement on Silver, December 21, 1933". Retrieved 2015-01-10. ↑ The American Presidency Project. "Proclamation 2067 - Ratifying the London Agreement on Silver, December 21, 1933". Retrieved 2015-01-10. ↑ The American Presidency Project. "White House Statement on Proclamation 2072, January 31, 1934". Retrieved 2015-01-10. ↑ The American Presidency Project. "Proclamation 2072 - Fixing the Weight of the Gold Dollar, January 31, 1934". Retrieved 2015-01-10. Sumner, Daniel. "Agricultural Subsidy Programs," in David R. Henderson (ed. ), Concise Encyclopedia of Economics. Indianapolis, IN: Library of Economics and Liberty, 2008.